NEW YORK—Parents signing up their children for prekindergarten next school year should consider checking them for a learning disability now. If a child gets diagnosed with a learning disability in the middle of a school year, transferring to a more appropriate program is usually a lengthy process, said a source at the city’s Education Department. Not every provider offers a full spectrum of special services. Every fifth student in the city has a learning disability or is an English language learner. Pre-K providers are supposed to be ready to accommodate such students. To have their child evaluated for any special needs, parents can contact one of the committees on special education listed on Education Department’s website. They can do so even before the next school year starts. Even though Mayor Bill de Blasio’s plan to fund universal pre-K hit an impasse in Albany, he is going forward with his plan. Pre-K admissions started on Mar. 3. The deadline for applications was moved to Apr. 23. 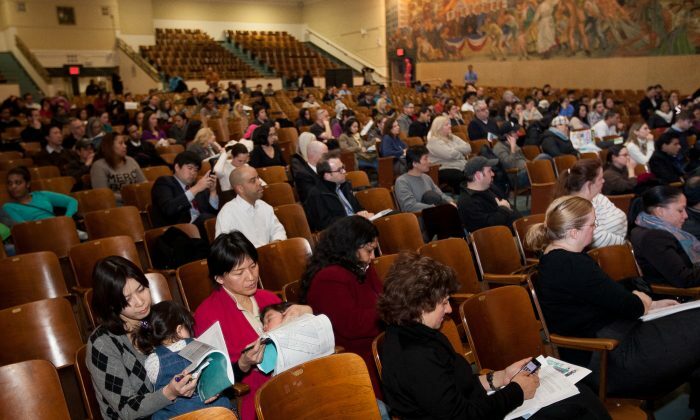 A pre-K information session at the High School of Fashion Industries in Manhattan attracted some 400 parents seeking answers about universal pre-K. Four more sessions will follow, one for every borough. So far, none of the new pre-K seats expected to open in September are available, but parents can apply for existing programs. Enrollment officials at the session said new seats should start to pop up in a matter of weeks and the enrollment office will let parents know. To get a child into a pre-K program provided by a community based organization, a parent has to contact the organization directly. No centralized system is in place. Pre-K seats in overcrowded areas, such as Lower Manhattan’s District 2, will probably be provided by community organizations. The same quality standards and curriculum apply to both DOE and community organizations providers.